The modern-day, gun-slinging police drama stars Timothy Olyphant as the rugged, old-school U.S. Marshal Raylan Givens, along with Walton Goggins as career criminal Boyd Crowder. The season guest stars Jeremy Davies in his Emmy-winning role as Dickie Bennett (Outstanding Guest Actor in a Drama Series, 2012). CULVER CITY, CALIF. (October 29, 2012) - The renegade style of justice is back when Justified: The Complete Third Season is released on Blu-ray(TM) and DVD December 31st from Sony Pictures Home Entertainment. The modern-day, gun-slinging police drama stars Timothy Olyphant (TV's "Deadwood") as the rugged, old-school U.S. Marshal Raylan Givens, along with Walton Goggins (TV's "The Shield") as career criminal Boyd Crowder. The season guest stars Jeremy Davies in his Emmy(R)-winning role as Dickie Bennett (Outstanding Guest Actor in a Drama Series, 2012). 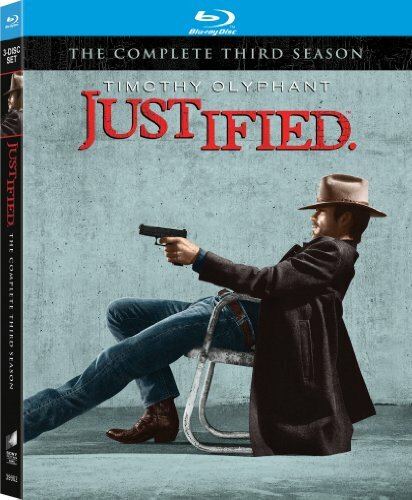 The third season of Justified finds Harlan County no longer under the rule of the Bennett family, while Boyd returns to the criminal life and Raylan struggles to keep the town under control. The critically acclaimed FX drama brings together additional all-star casting including Nick Searcy (Moneyball), Joelle Carter (TV's "Prime Suspect"), Jacob Pitts (TV's "The Pacific"), Erica Tazel (TV's "Jericho"), and Natalie Zea (TV's "Person of Interest"). Arriving on Blu-ray and DVD, the three-disc set comes with all 13 episodes, deleted scenes, outtakes, cast and crew commentary on nine episodes, and three all-new featurettes that focus on the making of season three, the stunts and a tour of Nobles Holler. Exclusive to the Blu-ray is a sit down interview between Olyphant and Goggins. and an enterprising and lethal criminal from the Motor City named Quarles. Justified is based on the short story "Fire in the Hole" by crime novelist Elmore Leonard (Out of Sight) and was developed for television by Graham Yost (TV's "Boomtown"). Season three of the series was executive produced by Leonard Yost, Michael Dinner (TV's "The Mob Doctor"), Sarah Timberman (TV's "Unforgettable"), Carl Beverly (TV's "Unforgettable"), Fred Golan (TV's "Boomtown"). Dave Andron (TV's "Knight Rider") served as co-executive producer and Don Kurt (TV's "White Collar"), Olyphant and Taylor Elmore (TV's "Cold Case") served as producers. Justified: The Complete Third Season has a run time of approximately 541 minutes and is not rated. Emmy(R) is the registered trademark of the ATAS/NATAS. Sony Pictures Home Entertainment is a Sony Pictures Entertainment (SPE) company. Sony Pictures Entertainment (SPE) is a subsidiary of Sony Corporation of America, a subsidiary of Tokyo-based Sony Corporation. SPE's global operations encompass motion picture production, acquisition and distribution; television production, acquisition and distribution; home entertainment acquisition and distribution; worldwide television networks; digital content creation and distribution; operation of studio facilities; development of new entertainment products, services and technologies; and distribution of entertainment in more than 142 countries. Sony Pictures Entertainment can be found on the World Wide Web at http://www.sonypictures.com.